The new video recording of an acclaimed theatre piece recounts the surreal workings of pianist Fred Hersch’s mind during a long medically induced coma. 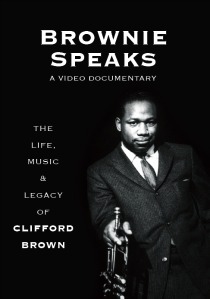 Documentaries about trumpeter Clifford Brown and the composer, arranger and vibraharpist Gary McFarland recall major artists who died as their brilliant careers were flowering. In 2008 Hersch had been feeling unwell and one day found himself unable to get out of his bathtub. His partner Scott Morgan rushed him to New York’s St. Vincent‘s Hospital, where doctors discovered that he had pneumonia. They eventually determined that the condition was unrelated to the AIDS/HIV that Hersch has kept at bay for more than two decades. (The DVD was released on World Aids Day, December 1.) Still, the pneumonia was so severe that the doctors made the unusual decision to put him into a deep sleep that would help protect him from tissue infection until it was possible to treat the disorder. The coma lasted six weeks, during which Hersch had dreams, some beautiful, some bizarre, some funny, all dramatic. He remembered many of them when he returned to consciousness. He told his friend the theatrical producer Herschel Garfein about the dreams. In 2005 the two had created an admired musical setting of Walt Whitman’s Leaves Of Grass. 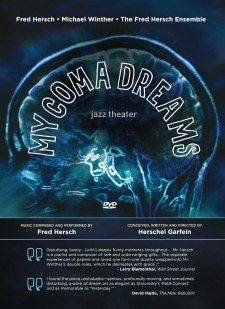 Now, they set about using Hersch’s coma dreams as the basis of a jazz theatre production. The presentation was recorded in performance before an audience at Columbia University’s Miller Theatre in the spring of 2013. It is a wondrous blending of Garfein’s story telling, new music by Hersch and virtuoso acting by Michael Winther, who also sings beautifully. Winther plays both Hersch and Morgan, often subtly melding the characters, delivering their lines conversationally without sacrificing anything of timing or the individuality Garfein wrote into the parts. He ranges around the stage, fading into the wings when the focus goes to Hersch and the 11-piece ensemble conducted by Greg Kallor. Judicious lighting shifts are part of the success of such moments. The stagecraft is simple and canny. Eerie rear screen projections are important to the atmosphere. Front screen transparencies now and then aid the narrative. 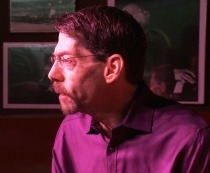 Hersch (pictured) performs with bassist John Hébert and drummer John Hollenbeck in his rhythm section. The horns include trumpeter Ralph Alessi, saxophonist and flutist Adam Kolker. Among the strings are violinist Laura Seaton and cellist Dave Eggar. Hersch has moving solo moments. The full chamber orchestra plays compositions that enhance Winther’s descriptions of the dreams. In one sequence, Hersch and Thelonious Monk are confined in cages and ordered to write new pieces. Whoever finishes first will be freed. Hersch is in a panic. Monk is relaxed and smiling. In another, Hersch dreams that he and Morgan are in a huge airplane outfitted like a luxury hotel or spa. Served by exotic flight attendants, Hersch orders “a Bombay, a Tanqueray, give me that old Jim Beam. I’ll have a Manhattan and an Old Fashioned. Where is my daquiri?” He gets drunk. Morgan gets worried. In a dream sequence called “The Knitters,” Hersch tells of finding himself looking down at a group of women, perhaps in a courtyard. They are knitting, and whispering, “We end as we begin.” He puzzles over what they symbolizethe hope of life, the inevitability of death, the Fates? Kolker’s churning tenor saxophone solo reflects on the answer. In “The Jazz Diner in the Woods,” Hersch is consigned to play a dreadful gig backing an incompetent singer. We catch glimpses of a menu featuring dishes like Don Cherry Pie, Jimmy Cobb Salad, Mysterioso Meatlof, Bright Mississippi Mud Pie. Here, the alto sax solo is a slice of bebop served by Bruce Williamson. Hersch has a sense of humor in his coma dreams. Toward the end, Hersch’s brain summons up “The Orb,” a green glow that seems to contain Scott’s face. He senses Scott saying, “Come to me. I love you.” For a month and a half, Scott has been by Fred’s side in the hospital, massaging his arms, speaking to him, hoping but never certain that Fred will return to consciousness. In a final sequence, the real Fred Hersch improvises a beautiful soliloquy, then gets up from the piano, looks over at Winther playing Fred Hersch on parallel exercise bars and becomes his own mirror image matching Winther’s movements. He is learning to walk. He is on his slow way back to the recovery that has allowed him to resume his career in full. This summary doesn’t begin to suggest the intricacy of the Garfein script or the subtlety and beauty of Hersch’s music. As often with superior works of the imagination, it may not be possible to absorb the production’s complexities in one viewing. Soon enough, everyone who seriously followed modern jazz knew. This film produced by veteran music educator Don Glanden tells Brown’s short story through the recollections of members of his family, teachers, colleagues, and friends with whom he grew up in Wilmington, Delaware. The soundtrack, with rare exceptions, is from Brown’s recordings. Interviews, dovetailed to create a narrative flow, include insights from Robert “Boysie” Lowery, Brown’s first trumpet teacher when Clifford was 12. Running commentary comes from trumpeters Gillespie, Donald Byrd, Arturo Sandoval and Clora Bryant; collaborators including Max Roach, Harold Land, Sonny Rollins, Herb Geller, Jimmy Heath and Quincy Jones; andmost movinglythe late LaRue Brown Watson, the trumpeter’s widow. Rollins tells of calling on Brown, years after his death, for inspiration when his own flagged. LaRue speaks of quickly progressing from skepticism about the value of Clifford’s music to being swept off her feet when he asked her to “marry my music and me.” The clip is perfectly placed in the production. Glenden uses the classic documentary approach of letting the film tell the story without a narrator. He creates an understanding of Brown’s congenial but firm personality, his clean life in a hard living milieu and the dedication behind what more than one observer identifies as the trumpeter’s genius. 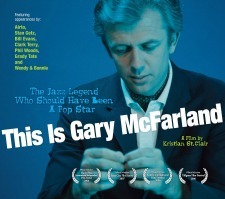 Gary McFarland thrived for a decade as one of the most admired young artists in modern jazz. In 1971 he may have been on his way to wide popular success when he was either murdered or died of a foolish mistake. He swallowed a dose of the artificial heroin called methadone and suffered a fatal heart attack. He was 38. No investigation has determined whether McFarland and a friend knowingly drank the methadone or someone slipped it into their drinks at a lower Manhattan bar. Both died, McFarland almost instantly of a heart attack, his friend the writer David Burnett in a coma a few days later. Now, despite the self-renewing freshness of his work, McFarland is largely overlooked outside of a core of admirers whose memories circumvent the quick-replacement mentality of the modern music business. This film by Kristian St. Clair could help lift the veil around the work of a musician whose quick rise from a small Oregon town to the top of the New York jazz milieu led the critic Gene Lees to identify him as an adult prodigy. In his scores for Gerry Mulligan, Anita O’Day, John Lewis, Stan Getz, Bob Brookmeyer, Bill Evans and others, McFarland managed to make his harmonies rich while also open and sunny. Unrestricted by conventional scoring practice, he created unique relationships among sections of the orchestra and produced an identifiable musical personality. His later work embraces a lighthearted pop-rock-samba sensibility but also, in the album America The Beautiful: An Account of Its Disappearance, a clear-eyed evaluation of the country’s 1960s foreign policy, political and environmental quagmire. The new DVD, re-edited from an earlier version, is expanded with more and better images of McFarland in action, including the making of his famous Fresca commercial in a television studio snowstorm. The film places McFarland in a community that in the 1960s was still enjoying what a number of critics and historians of the music, including this one, have identified as the final period of a golden age of jazz in New York. The closeness of that community and the fellowship of its members are highlighted in a section of the film devoted to the midtown Manhattan bar Jim And Andy’s, off-duty headquarters for dozens of the music’s leading figures. St. Clair’s film reports everything known about the circumstances of McFarland’s death, including the sparse recollection of drummer Gene Gammage, who survived drinking some of the methadone that killed McFarland and Burnett. It has interviews with McFarland’s widow. Musicians who express unreserved admiration for McFarland and his work include Grady Tate, Clark Terry, Bob Brookmeyer, Steve Kuhn, Bill Kirchner, Richard Davis, Gerry Mulligan, Sy Johnson and Antonio Carlos Jobim. Forty-three years on, it grows less likely that the mystery of McFarland’s death will be solved. The importance of this film is its documentation of his intelligence, his joy in making music, the enduring quality of much of his work and the standing he enjoyed among an impressive cross section of his contemporaries. It is likely that to most of the listening public, McFarland was a major star compared with Warne Marsh (1927-1987). A tenor saxophonist, Marsh was one of the musicians who studied and performed with pianist Lennie Tristano. With and without Tristano, he often teamed in influential recordings with alto saxophonist Lee Konitz. Marsh inspired contemporary saxophonists who have gained far more renown than he did, among them Mark Turner and Anthony Braxton. His son, K.C. Marsh, intends to call attention to his father’s importance by making a documentary film. As most such projects must in the climate of today’s cultural economy, Marsh is asking for help in producing Warne Marsh: An Improvised Life. For details about what he needs, and to see him make his case, go here. For the history of the music and for the stories of these artists, this post is essential. Thank you, Doug. There is also a beautiful new documentary on Frank Morgan currently making the festival rounds. It’s called Sound of Redemption, and according to the director, NS Heikin, it should be available on DVD in about a year. I’m deeply appreciative of the mention. I do seek to elevate my father’s legacy (Warne Marsh) as well as get to know the music and the man better. I’m so grateful for the support for this project. I believe that the over four years of shooting 30 hours worth of interviews, traveling to various countries and all over the U.S. will do justice to his musical legacy. We have wonderful interviews from the likes of Lee Konitz, Mark Turner, Pete Chistlieb, Gary Foster and Jonathan Kreisberg amongst many others including the immediate family, students and fans. Fond regards to all the Warne fans out there. Follow us at Seed & Spark dot com. Thanks for this wonderful installment. I am especially pleased about the acknowledgement of Fred Hersch’s My Coma Dreams. Your summary is full of what will be new information for many Hersch devotees. And what’s even better is presenting Hersch, Clifford Brown, Gary McFarland and Warne Marsh in the same installment. A great tribute to the diversity and inventivenessand frequent tragediesin American jazz. And a great tribute to your work. Thanks for all of these reviews. Clifford is one of the first musicians who really grabbed me as a teenager, so I immediately ordered the DVD. I just finished watching “Brownie Speaks,” and while I agree with your assessment of content, I was greatly disappointed by the lack of attention by an audio production professional. The music tracks were full range, but transferred at very high levels. The interviews were at much lower levels, and were often muddy and hard to understand. This contrast made it very hard to listen to — if you set the listening level and tone controls so that the music sounds “right” the voice tracks are not nearly loud enough. If you turn up the listening level and adjust the tone controls to improve clarity of the interviews, the music blows you out of the room. Professional production would make these adjustments when the program was mastered. Yes, the original source material was all over the place with respect to audio quality, but it’s trivially easy to fix that with simple equalization and setting levels. I’m making these comments hoping that other “videographers” will realize that audio is important, and just splicing stuff together for content isn’t enough. Clearly the producers of this video didn’t listen to the final result.